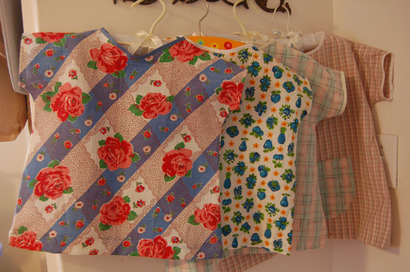 SouleMama: sewing for the shop! Finally. I had grand plans of keeping the shop stocked this year, and here we are on the last day of January with only my first update. Part of the stall was that I got myself stuck in a bit of an over-thinking cycle, worrying about things like whether or not I really want to make things to sell, and what that all means and looks like for me, worrying about whether or not my stuff has a 'look' or is good enough, how to price things and value my time and energy, whether I want this blog connected with something 'for sale', and on and on and on. But thanks to the dear friends around me for shaking me out of my head and making it clear. It really can be as simple as making the things I want, and offering them for sale for those who might want them. Can't it? I think it can. So I've let go of all the ideas I had about how I should sell things, and I'm just making the things that I love. Which means that I have no idea what will be in the shop next week. But I can tell you that it will be something I love, and something I loved making. Quite freeing, I'll tell you. And true to that, the things that are up in the shop today are all things that I've also been making, loving, and enjoying of late. 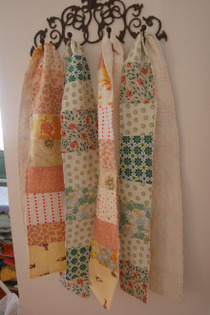 There are some patchwork scarves, all backed with the vintage chenille (also used on Adelaide's pants). I've had such fun pouring through my gigantic basket of scraps to put the fabrics together for these - it's been a great way to play with color. And the scarves are of the weight that I love most - not too heavy. And pretty. Because that's important. In addition to the scarves are some bags. The simplicity of these is so enjoyable to me - I'm loving having several of them around to be used for anything and everything from groceries, a diaper stash, or knitting. 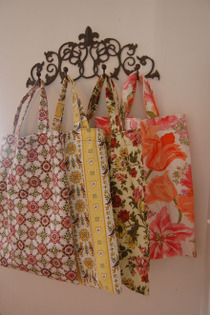 Multipurpose, easy, and pretty (all vintage fabrics) - just what I need right now. And then the smocks! You knew those were coming, right? I know I've made a few for Adelaide in more modern prints, but I'm feeling a little sentimental about the original - the thrifted vintage one I found that is so soft, and so lightweight in it's 40's fabric, and simple, practical, and well constructed. 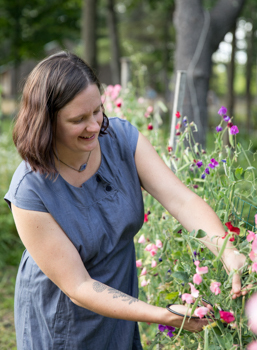 It evokes such feelings for me of so many things - a connection to women before me, handcraft for necessity and beauty, and a strength and heart of home. 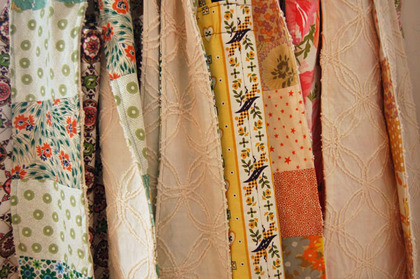 So to keep that special feeling with each smock that leaves my hands, I think I'll sell smocks when I find bits of that soft, vintage fabrics that is just right. (alright, really it's also part of my master plan to have us all wearing 40's and 50's vintage clothing. That would be swell). New treats in the shop! Thanks for reading and for your support, friends. Really, Thanks.